1. Heat 2 tbsp oil in a large lidded pan. Cook the onion over a low heat witha splash of water for about 10 minutes, until soft and golden. Add the garlic and ginger and cook for 2 minutes more. 2. Stir in the rice, stock and lemon peel; cover and bring to the boil. Turn the heat to the lowest setting and simmer for 20-25 minutes, until all the water has been absorbed. Turn the heat off and leave for 5 minutes. 3. Meanwhile, heat the remaining 1 tbsp oil in a large frying pan and cook the kale for 3-4 minutes, stirring, until wilted; you may need to do this in batches. 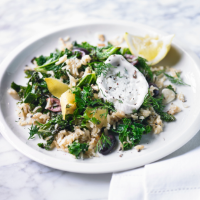 Fluff up the rice, stir in the kale, dill, olives and lemon juice to taste. Season and serve with the goats’ cheese sliced over the top.